ELLA: FIRST LADY OF SONG — Delaware Theatre Company, 200 Water Street, Wilmington, Del. 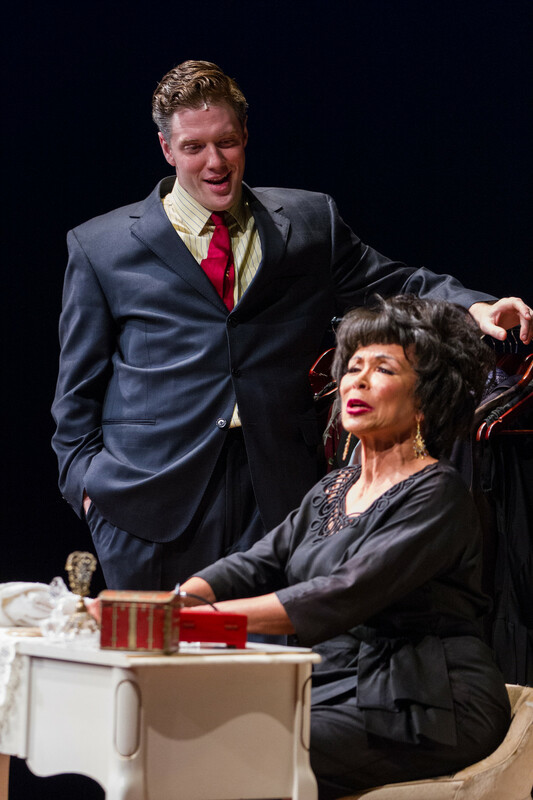 Through Sunday, May 13 — Freda Payne does some lovely singing in “Ella: First Lady of Song” a biographical tribute to the song stylings of one of the best and most versatile singers that ever performed, Ella Fitzgerald. Payne, known for a 1970 pop hit, “Band of Gold” but respected in the realms of music and theater for much more, does especially well on late first act numbers, “The Nearness of You,” “Taking a Chance on Love,’ “Easy Living,” and especially swinging “Lady Be Good.” She repeats that success in “How High the Moon,” “The Lady Is a Tramp,” and “The Man I Love” in Act Two. But Freda Payne is Freda Payne, a star in her own right with a distinctive voice and delivery that serves the songs she does best but that does not capture the style or tone of Ella Fitzgerald. Despite the title and reason for Lee Summers’s show, you don’t want Freda to be Ella. She is at home and entertains grandly as Freda. There’s the rub. “Ella: First Lady of Song” might do better with a lesser known singer playing the iconic Ella, one who more matches the pure bell-like quality of Ella’s voice, who phrases more naturally in Ella’s way, and who can act. Payne, as usual, makes you love her. As I’ve said, she earns headliner status. But I repeat she does best when she can do thing her way, as a star would. Except for some first-rate and truly witty scatting, you never think you’re seeing Ella Fitzgerald. You’re always aware you’re seeing Freda Payne. OK, so you forget about Ella, except in spirit, and revel in Freda, which is never hard to do. Then where’s the tribute? Where is anything like Audra McDonald losing herself to become Lady Day? Where even is Jessica Wagner channeling definite Winchester, Virginia gods to become Patsy Cline? The channeling, the sublimation, the transformation doesn’t happen in Wilmington. “Ella: First Lady of Song” is entertaining in spite of this. Especially in its ample musical sequences. But it lacks a core and forgets its focal point. Yes, in Payne you get someone who can stylize and sell a song. That scatting is delicious. But only occasionally do you hear a vocal likeness to Ella Fitzgerald and never is there a physical resemblance, even with a great collection of wigs. Even if she’s not right for the part of Ella, Freda Payne keeps things humming. There’s good work from Harriett D. Foy, Wynonna Smith, and Jake Blouch, too. With all of their fineness, there is one problem “Ella” cannot surmount, the slurpy clichéd melodrama of its hit-the-same-note-100-times book. Summers just lards on layers of angst and hardship that seem to derive from every rags-to-riches show business story for the last two centuries. It wouldn’t surprise me if a drama about the tough life first actress to play “Medea” is among the lost manuscripts of Greece. Summers’s script has every hackneyed plotline you’ve slogged through since the dinosaurs. All that’s missing is Susan Hayward. Ella’s poor. Ella’s considered ugly and awkward. Ella embarrasses her family by living unwashed on the street. Ella sings and dances for nickels on street corners. Ella gains recognition by entering a contest. Show biz folk appreciate her talent but are unkind to her. Others want to change her. Then comes that one talent scout who knows how special she is. Stardom brings new challenges. Race is a challenge. Love is challenge. Dealing with her family is a challenge. A lot that is dramatic occurs in Summers’s play, but none of it elicits genuine emotion because it’s all so cookie-cutter, all so seen-before. And better. Ella’s story becomes soppy. Harriett D. Foy tires her best to add some fire and some empathy to Summers’s well-worn dialogue. Jake Blouch provides energy as a series of agents. It doesn’t matter. Summers’s book has no traction. It never makes you care. And, stylistically, it works so hard, overly hard, to make you care. That’s part of the problem. A routine book is played as if it’s the most serious and compelling in the world, as if a story of interest is being told. And all we see is a plot we could recite in our sleep. Schmaltz and sentimentality take the place of genuine sentiment that might make a difference. It is no surprise that the conceiver and director of this begging to make the familiar important is Maurice Hines. Maurice is fun, and Maurice is talented. Very, very talented. He could be a master entertainer but for one fault, a fault that makes me cry when I think he can’t overcome it. He overplays. He almost panders to an audience that would adore him if he would just ratchet down a few levels of needy emotion and let his natural and prodigious talent do the work. Maurice sweats through evenings he has the chops to make a breeze. This is a man who can do more than most entertainers and sabotages himself by practically pleading to be noticed and loved. I have a preference for discovering new work as it happens rather than reading about in advance. That means I didn’t know Maurice Hines was involved with “Ella” until just before the show began. The minute the book scenes emerged, I sensed his ham-handedness. Nature cannot take its course when every idea or emotion has to be milked to its nth degree, and to the ninth power yet. Summers’s book would never have been good, but it might have proved serviceable, or good enough, as a bridge between songs, if every scene wasn’t played with such anxiety and effort. Instead of magnifying pain or disappointment or loneliness, Hines’s approach cheapened those emotions. Angst and melodrama took the place of simple — simplistic? — storytelling and rendered it inconsequential and par-for-the-course. Harriett D. Foy worked wonders keeping her head above ground as the cousin/companion who took care of Ella and her affairs during the singer’s many years performing live throughout the world. 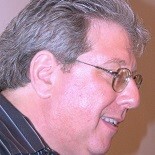 Jake Blouch proves once again he is among the most versatile and engaging actors in the region. Wynonna Smith contributes mightily as Ella’s younger sister, whose life is more calamitous than Ella’s and devoid of the glory. These actors make the most of what they are given, but they cannot defeat the mushy patina Hines puts on it all. Freda Payne sings and scats like the champion she is, but her acting has no life to it. Lines are delivered, not given emphasis or conversational color. Payne wins her kudos in song. Foy has to do the heavy lifting dramatically. All of this makes “Ella: First Lady of Song” a push-me-pull-you kind of show. Fitzgerald-like or not, Payne dominates the house when she steps to a mike to sing. You long for these musical interludes and hope several songs will be done in series. When the singer gets cooking, you don’t care if it’s Ella. Freda is just fine and especially wonderful when she can be herself and noodle freely with the band, as a jazz singer would, or do things Freda excels in that may not be part of Ella’s repertoire. William Foster McDaniel’s band is the real McCoy and another reason why music is not only the core of this production but the element that saves it. Two the musicians step into character roles, but they do their better work wielding their instruments under McDaniel’s direction. BULLETS OVER BROADWAY — Resident Theatre Company, Uptown! Knauer Performing Arts Center, 226 N. High Street, West Chester, Pa. — The first thing I look for when I attend any fledgling theater for the first time is a will to do good work. The Resident Theatre Company, establishing itself in West Chester, certainly has it. It’s production of Woody Allen’s “Bullets Over Broadway” seemed polished beyond some of the physical shortcomings of its venue, such as a stingily low proscenium height, introduced several delightful, unfamiliar talents, kept a brisk, engaging pace, and gave the region in general the chance to enjoy what I feared would become a neglected piece. “Bullets Over Broadway” didn’t get the reception it deserved when it opened on Broadway. Allen was criticized for cobbling a score from existing music instead of writing a fresh one, as if that matters beyond what pundits think it’s clever to say, and attitudes towards Allen and his style of humor have changed course since “Bullets” debuted as a movie in 1994. Currently, Allen is the subject of the neo-McCarthyism that keeps his latest movie, “A Rainy Day in New York,” from being released because today’s Puritans are more concerned with an artist’s personal life than his or her talent or work. In plot and dialogue, “Bullets Over Broadway” is flat-out funny, Allen being keen enough to know when to surprise with a rejoinder or deliver with full effect exactly the bon mot that’s expected. Of course, there’ are plenty of ironic, self-effacing, and cutting jokes that entertain and remind you why Allen ranks among America’s greatest humorists, even if fashion is currently running against him. Kristin McLaughlin Mitchell’s direction is strong in bringing out humor and characterization. Her production hums along, even during some involved scenery changes, and is aided mightily by Dann Dunn’s lively choreography. 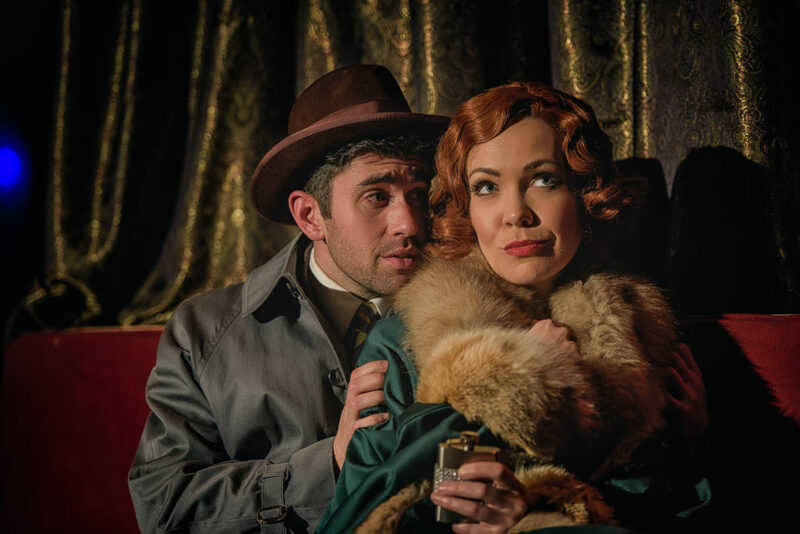 The aim of “Bullets Over Broadway” is to provide some naughty, amoral, ironic fun, and the Resident troupe accomplishes that well. They get the brightness of the piece and can be broadly comic without overdoing it or seeming to force or self-consciously present Allen’s jokes. On the contrary, the cast was adept in making the gag lines seem natural to their characters and their voices. 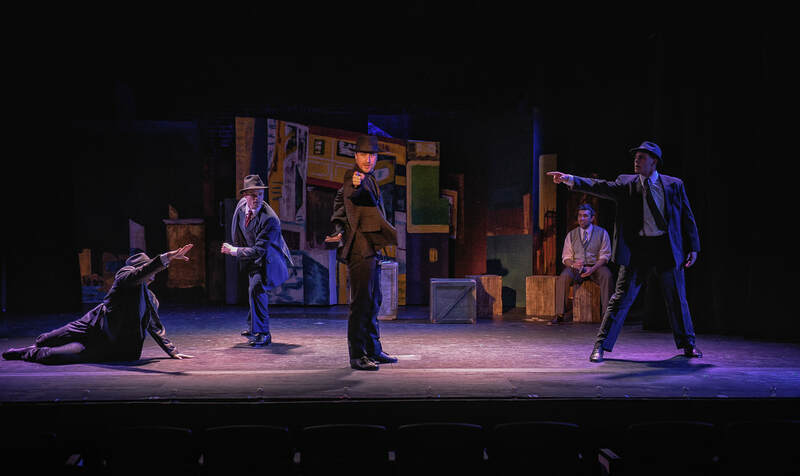 Exaggerated as “Bullets Over Broadway” intentionally is, Resident’s domestic scenes, rehearsal scenes, romantic scenes, and nightclub scenes retain a core of reality amid the shtick and the laughs. Tyler Hatch (Cheech), Karis Gallant (Olive), Robert Anthony Jones (Warner), Bailey Seeker (Ellen), and Michael Berry (David) all did such impressive jobs, I’d be eager to see them perform again. The stickout, though, was one of the region’s established leading ladies, Jennie Eisenhower, who endowed the diva Broadway star, Helen Sinclair, with the requisite boundless ego while bringing her down to earth in some key scenes, mainly those in which David Shayne’s play is being rehearsed, and alternated nicely and with canny distinction between fiery and pragmatic romance. Eisenhower brings her distinguishing luster without diminishing anyone else’s star. This is not Act II’s “Kiss Me Kate” in which she seemed to be the only person, including the director, who knew what the show was about. In “Bullets,” Eisenhower’s polish and the big effect of it gives ‘zazz to Mitchell’s staging while being in keeping with Helen’s own status and flair for visible presence and oversized drama. Eisenhower gives professional tone to the show, She also makes Helen seem real. All of the roles in “Bullets” can stray easily into caricature or stereotypes. Eisenhower conveys the foibles and desire for attention that is endemically part of Helen, but she wraps this within total portrayal instead of letting gloss take over and do all of the work. Eisenhower makes particularly great use of the voice she chooses for Helen. Its lush, pear-shaped tones serve the character as a diva in her personal realm and as the actress playing melodrama in the play to which she lends her celebrity. Her castmates follow suit. Karis Gallant balanced the irritating stridency, demanding nature, and inescapable crudeness of Olive Neal, the gun moll who wants to be a Broadway star and becomes one by having her mob kingpin boyfriend muscle her in after financing the show, by making you believe Olive is a creature who could exist on Earth, a la Lina Lamont or Billie Dawn, rather than a stock floozy. Gallant captures Olive’s ambition while also conveying her delusion and willingness to force her way. I’ve seen “Bullets” three times, and Gallant did a better job of keeping Olive from being a type than her Broadway or touring counterparts did. Michael Berry keeps David likeable even when he’s being despicable. You see the playwright learning to go along with ropes his integrity originally insists he sever, and you see him growing in to a Broadway dandy that is more exciting than anything he can achieve via integrity. It’s fun to watch Berry’s David opening to the suggestions of the more intuitive Cheech about how to give a play the common touches that will earn it praise as literature while assuring its appeal to the public . Tyler Hatch never relinquishes the mobster’s persona as Cheech. The bluntness for which Cheech is known serves Hatch well both as a mob enforcer and as a natural critic and play doctor who improves David’s Broadway-bound work. Hatch is best at finding Cheech’s nonchalance. He is easygoing about killing and in his stride with playwriting. This is a guy who says it like it is as an observer and does the job he’s paid to do as a gunsel. Only bad acting makes Cheech violent beyond his profession. Hatch and Gallant each make you endorse Cheech’s instincts and the steps he takes as a proud, if uncredited, author. This entry was posted on April 26, 2018 by nzoren in Theater Reviews and tagged Bailey Seeker, Bullets Over Broadway, Dann Dunn, Delaware Theatre Company, Douglas McGrath, Ella Fitzgerald, Ella:First Lady of Song, Freda Payne, Harriett D. Foy, Jake Blouch, Jennie Eisenhower, Karis Gallant, Kristin McLaughlin Mitchell, Lee Summers, Maggie Griffin-Smith, Maurice Hines, Michael Berry, Paul Weagraff, Resident Theatre Company, Robert Anthony Jones, Tyler Hatch, Vincent D'Elia, West Chester Pa., William Foster McDaniel, Wilmington Del., Woody Allen, Wynonna Smith.